There is a vast array of employer benefits and insurance options and costs. How do you know which sets of benefits are best? It is too difficult to take all of these variables into account. The Lindex simplifies this process. The Lindex is a complex algorithm that measures the availability, costs, and use of many key benefits and provides an indexed number between 0 and 100. Why Should I Use the Lindex®? How is the Lindex® calculated? Over 1,000 organizations participate in the Iowa Employer Benefits Study© on an on-going basis each year. The Lindex is calculated from these study results. It is based on a variety of factors including types of benefits offered, preferences employees have for each specific benefit, and employee costs associated with those benefits. 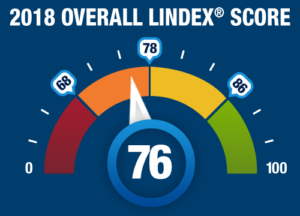 The Lindex ranges from 0 to 100, with lower scores indicating fewer and more expensive benefits, and higher scores indicating more comprehensive benefits being offered at a lower cost. What are the Lindex® scores from the 2016 Study? 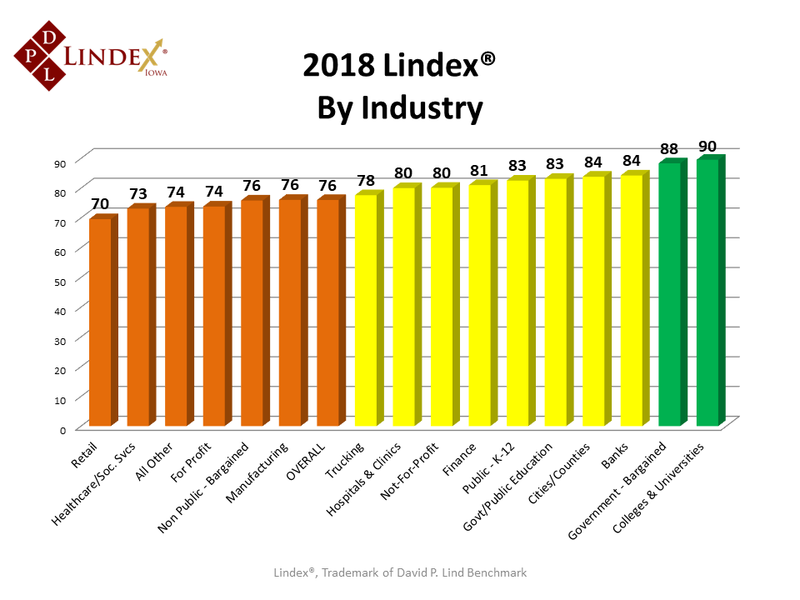 In 2018, the overall Lindex score for Iowa employers (regardless of employer size and industry) was 76, which rose from 74 in the last study two years ago. The Lindex score will vary based on the employer size and industry. For example, employers with fewer than 10 employees have an average Lindex score of 65, while employers with at least 1,000 employees averaged 86. Employers in the retail industry averaged 70, while state and local government-bargained employers averaged 88. How do I interpret my organization’s Lindex®? As stated, the Lindex ranges from 0 to 100. A higher score indicates that an organization offers its employees more benefits at lower costs. However, benchmarking is important. The Lindex is calculated annually statewide and for each of the several industries. An organization can assess their benefits compared to others in their industry and the entire state. 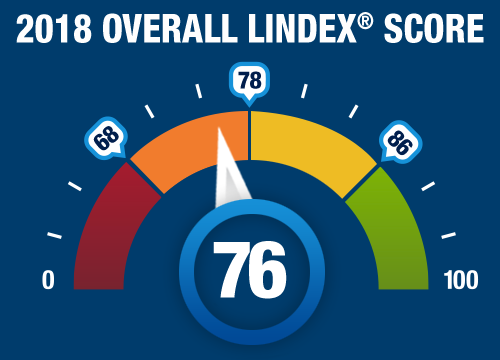 For example, an organization with a Lindex score of 64 might appear to be somewhat low when compared to the statewide Lindex score of 76, however, should 64 be above the average Lindex score for similar organizations (based on employer size, location and industry), then it could be considered a favorable score for your organization. If we don’t change our benefits in the next year, will our Lindex® score remain the same? 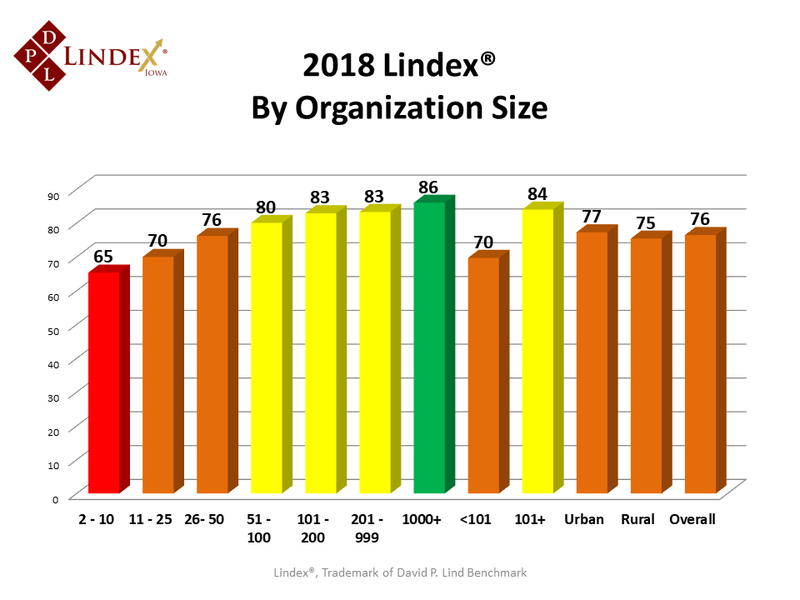 The beauty of the Lindex is that it provides you with a summary of how your organization compares to other Iowa employers. Your score is recalculated each year, in relation to all other participating organizations. This means that your Lindex score will most likely change in future years based on the responses of other employers who take part in the Iowa Employer Benefits Study©. Should your benefits remain unchanged next year while many other employers tweak their benefit offering, your Lindex score will change because your benefits will be compared with the new benefits offered by others. For example, if many respondents reduce their benefits while your organization makes no changes at all, your Lindex score will likely increase because it now compares favorably to other reported benefits. This “relativity” comparison makes the Lindex a valuable tool for employers; each year you will know how you compare to current state averages. Contact DPLB to learn more. In addition, visit with your benefits consultant to learn if they are authorized to have access in developing your Lindex score. If your consultant does not currently participate with the Lindex program, have them contact DPLB to learn how! Will my Lindex® score be kept confidential? Absolutely! It’s up to your organization on how you wish to use your score. Why can I trust the Lindex®? Since 1999, David P. Lind and Data Point Research have conducted over 14,000 interviews with Iowa organizations. The Iowa Employer Benefits Study© measures a statistically valid sample of employers in major industries, providing a great deal of confidence that the results accurately reflect the entire Iowa employer community. Depending upon the benefits offered by each organization, over 250 variables have been collected. That is a lot of information! When combined with the other research conducted, such as the Iowa Employment Values Study© and the professional expertise of David P. Lind, the Lindex is an accurate, unbiased summary on employee benefits in Iowa. How frequently is the Lindex® calculated? On a statewide level, the Lindex is calculated once a year. Who is David P. Lind Benchmark? David P. Lind Benchmark is Iowa’s trusted resource for employee benefits research. The research through David P. Lind Benchmark provides employers with fresh, relevant, and local information on benefit packages offered to Iowa employees. The Iowa Employer Benefits Study© is a comprehensive statistical review of Iowa employee benefits that is a key resource for employers and policy makers in Iowa. Who is Data Point Research? Data Point Research is a full-service research organization who has partnered with David P. Lind since 1999 to conduct the Iowa Employer Benefits Study©. The focus of Data Point Research is on research projects that help their clients improve employee and customer satisfaction, and understand health and social issues. Lindex® is registered in the U.S. Patent and Trademark Office. Have more questions about the Lindex? Please call us at 515-868-0920.